Once in great while, my job requires me to travel. Since my field is unglamourous, the destinations usually aren't either. New York? Miami? Las Vegas? Done them all, but always on my own dime. No, when the company foots the bill, it's usually for a trip to someplace like Greenville, South Carolina or Hartford, Connecticut. Cities where people live and work, not where tourist come to play. But this isn't to say that these aren't worthwhile locales to visit. Downtown Greenville was contemporary with the requisite Southern charm and character. The restaurants offered stick-to-your-ribs food that still haunts my dreams. One of the best plates of fried chicken I've ever had I ate in Greenville. A few weeks ago it was Ann Arbor, Michigan. Having visited Michigan only once before, in a city called Pontiac, I half expected Ann Arbor to be more of the same. Pontiac, from what I remember of that trip I took exactly a decade ago, was a blue-collar town with more fast food joints than anyone could ever need or want. But as soon as I arrived in Ann Arbor, I knew -- this ain't Pontiac. Anchored by the University of Michigan at its nucleus, Ann Arbor is a college town brimming to its borders with coffee shops, book stores, and restaurants -- a midwestern burg with hints of Berkeley liberalism, a splash of Manhattan class, and the polish of Pasadena. But to compare Ann Arbor to other cities is to insult it. It's got a proud personality all its own. And what I found on my own was only surface level scratch, confined to a few hours on a night I had free time. But I was so impressed by what I saw that on my flight back to Orange County, I made a vow -- to be better prepared the next time I was sent out this way. My mission: to eat where the locals eat; to walk where they tromp. A scant few weeks later I learned that I would be returning to Ann Arbor for a second time. Without hesitation, I e-mailed Joy, a reader of this humble blog, who now lives in Irvine but used to be an Ann Arbor local. She graciously provided a list of her favorite haunts. I printed her recommendations, stuffed it in my travel bag, packed a camera, and booked an extra day at the hotel. 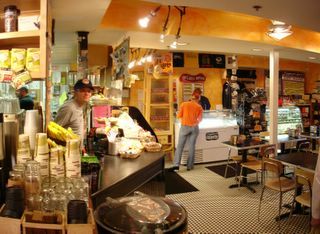 A2, as locals like Joy called it, has two institutions other than the University that are destinations in and of themselves: Krazy Jim's Blimpy Burgers and Zingerman's Delicatessen. Blimpy Burgers was an enthralling experience. I was giddy with delight when I first saw the place. It's a small, greasy spoon with old swivel chairs. 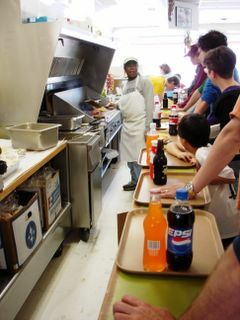 The line to order saddled up to a sizzling griddle and a bubbling deep fryer. I was eager to eat, but one thing Joy said stuck in my mind. She warned that the people who worked there sported an attitude and expected that customers order with precision and without hesitation. I was thinking Soup Nazi from Seinfeld, but didn't really believe it. The first visit I made was on a weeknight. The joint was nearly empty, but alas, it didn't stop the young grill-man from yelling at a customer who was unwise enough to answer his cell phone in line. "Take it outside! Can't you read the sign!?" he said as he pointed at it with his greasy spatula. So before I saddled up to order, I wiped the smile off my face, righted myself, and rehearsed what I would say over and over in my mind. "Double with egg, on an onion roll. Double with egg, on an onion roll." As soon as I flawlessly rattled off my order, the guy plopped down two spheres of raw meat, the size of golfballs, directly onto the grill to heat. Then, without warning, he smashes it flat with his spatula to finish cooking on that side and then a final flip to finish. A fried egg, tomato, lettuce, onion, pickles and a slather of mayo later, my burger was ready to eat. An order of habit-forming, crunchy onion rings came in tall singular lacy gob that reached for the ceiling. The burger was delicious. If I had to decribe it, it's as if In-N-Out and Fatburger decided to marry, have children, and move out to the Midwest. The patty is thin like In-N-Out's, but the add-ons like fried egg, chili, and bacon makes the burger endlessly customizable, à la Fatburger. They tout the fact that there's over a million possible Blimpy Burger permutations. With unconventional extras like salami, I don't doubt it. On the second trip made over the weekend, a woman was flipping the burgers. It was then that I saw the trademark Blimpy Burgers attitude in its full splendor. No one was safe from her acid tongue. Fellow customers, her own co-workers, even small children -- if someone did something she didn't approve of, she'd have something to say to them. This was a mean woman who made mean burgers. 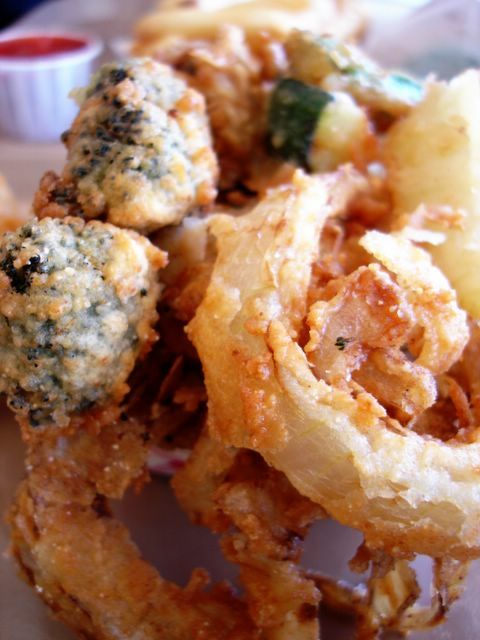 This time around, to accompany our Blimpy Burgers, we asked for the deep fried "Mixed Veggies". Mushroom, broccoli, cauliflower, onion and zucchini are dusted in a seasoned flour and cooked in gurgling oil to a deep golden brown. It was tempura-like in its execution, but exhibited a crumbly crunch instead of a light, lacy crisp. This was a side dish that's both dangerously addictive and unhealthy. Definitely the wrong way to get your daily recommended serving of vegetables, but why does it feel so right? Zingerman's Deli is revered for being the best deli in America that isn't in New York City. Some folks in Ann Arbor might even debate that statement. 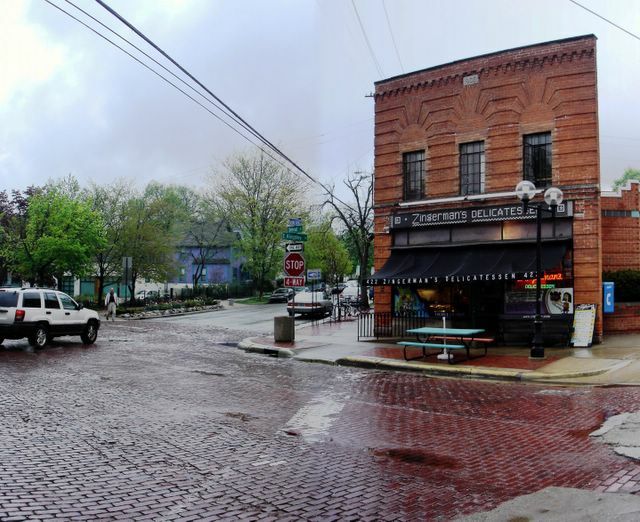 They'd passionately proclaim Zingerman's as the best in the U.S. I'll leave the verbal brawls to others who know better. But for what it's worth, I quite enjoyed the sandwich I ordered. Although I'm used to fattier, wetter incarnations seen in California, the carved pastrami and corned beef was just what I'd expect from a deli with Zingerman's reputation. Flanked by two kinds of bread with two kinds of cheese and slathered with a good deli mustard, it made for a hefty dinner. Housed inside a cramped brick building, the store was well-stocked with hanging meats, cheeses, and canned goods. One shelf towered above all others with golden loaves of bread, some braided and some crusted with seeds; a gallery with edible works of art. This is the Louvre of food in Ann Arbor. Next door to the deli, was Zingerman's "Next Door" which looked like a house the company took over to sell desserts and coffee. This was also where customers of the deli would be served if they chose to dine in. We did on our last visit and sampled an exquisite but simple slice of cocoa cake with a scoop of vanilla gelato while enjoying the spring air on their patio. The employees, perky and cheerful students from the University, were all probably very happy to be working at the town's landmark. Or maybe it's perhaps because they get discounts on shots of espresso. What a coincidence!! My sister's bf applied to the University of Michigan for med school and she's going with him to visit it next month. I'm gonna make her take home a Blimpy's burger for me, haha. Beautiful Kodak slideshow Elmo. It really showcased your photography abilities. I enjoy your writing so much. I could literally taste the hamburger with your In-N-Out + Fatburger description, and also I loved the description of Ann Arbor as Berkeley + Manhattan + Pasadena. I love analogies! The food and the city sound fabulous. I felt that was there with you (as a sneaky guest) with your post. And you found good Japanese food too, good job! SO glad you had a good time. Now I'm homesick, but in a good way. Thanks for the trip down memory lane. Hey Elmo - Nice foodie tour and photos. Looks like you handled the burger pressure real well. I am so envious that you made it to Zingermanns! That was a great post! 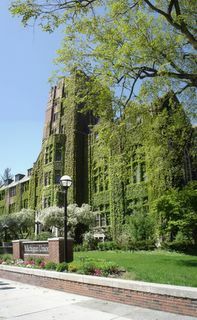 Ann Arbor looks so beautiful--in full spring bloom. I'm a native socal girl, so I'm a sucker for all that greenery and "historical" looking buildings :D The photos also came out great--good job, elmo! Just warn her to be on her best behavior when ordering! Wish her good luck for me! Thanks so much as always for your generous compliments. I'm not always deserving, but I'm always appreciative! Thank you again and again for your recommendations. Those extra days we spent on car rental and hotels wouldn't have been worth while had it not been for your tips. P.S. It just hit me...ARBOR!!! I get it! I escaped unscathed...somewhat. Although I'm beginning to think that it might have been just an act. But then I wasn't about to bait that shark. Are you from the area too? 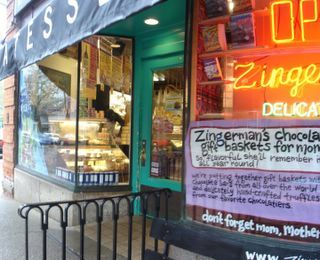 You know I hadn't even heard of Zingerman's before Joy pointed it out to me. Now I'm glad I did. I brought their catalogue home! It's a great little town. Those college students have it lucky...well, not so much because they still have midterms, finals, and all that studying to go through...but at least they've got great places to eat and hang out. Great road trip review. You have done yourself proud. I remember Ann Arbor well as it was the only thing in Michigan that I found redeeming. Zingerman's is famous and while I didn't get to stop there, I was told about it endlessly, so I have always noted what I need to do the next time I am in AA. Sorry Elmo - Anon wuz me.....loved the photos of the scenery and greenery! 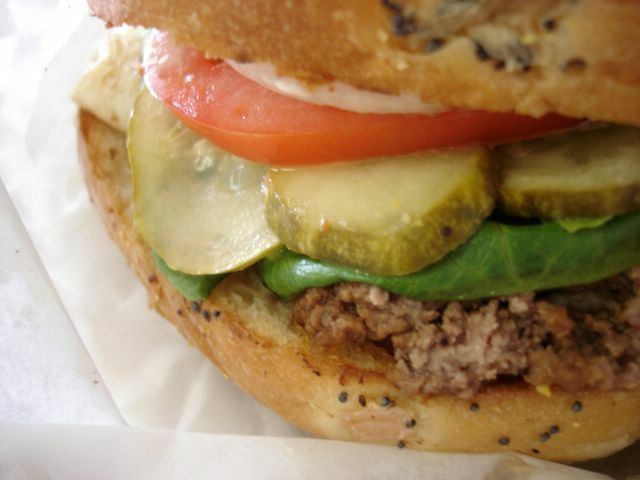 You definitely know your burgers through and though! The In N Out & Fatburger comparision was perfect - I can just picture (and eat) it! You've been to A^2 too? I guess I'm late to the party in discovering this little village. I hope I have more opportunities to break out of this OC cocoon that I live in -- if only to discover more places like Ann Arbor. Dat's cool man. Thanks for always coming to visit! It's a great town! So envious that you actually got to live there for a while. I would've gotten fat from the fried foods at Blimpy Burger. The only thing I wish I did was tried it with some salami...that would've been wicked! And thanks for the compliment! Guess where I am from? Yep! The Ann Arbor area. I love the brownies at Zingerman's. The pickles are good, too. Another place you really need to go when you next visit A2 is Seva. It's a vegetarian restaurant. But I am not a vegetarian, and I think it's the best restaurant in the city.And if their cocoa cake is available (desserts are seasonal for them) you have to have some! That truly was some great cocoa cake! Yum! Zingerman's is something special. i haven't been back to ann arbor since we moved away when i was 9 years old. but i still remember zingerman's. my parents, who moved to chapel hill, nc where there is not much in the way of gourmet food, still complain about the lack of zingerman's. Next time you go to Ann Arbor, you ought to try Zanzibar's (on State Street) and Shakolad's Chocolate Factory. Two of my faves in AA! I grew up in Ann Arbor and went to the U as well. Blimpy Burgers is the best burger i have ever had hands down. the lady you mention in the blog is known as "Rude Dog". Be careful, and tread lightly with her. Other things not allowed are ordering for someone else while they save a table. a big no-no. It really is like the soup nazi kitchen. Also high comedy entails when a group of asian kids or any foreigner tries to order. the motto is "Cheaper than Food". As for Zimmerman's it's really good but expensive. I remember getting a reuben and it was like $13. and that was 7 years ago. I had the opportunity to try Zingermans out when I visited Ann Arbor, but really visiting Michigan State University for a campus tour. This place was recommended by my family's close friends who used to live in Gross Point. Anyways, I ended up trying the Rueben which was around $12. It was delicious, but the prices are outrageous for what you get. 6oz of meat I believe. I think that you can find better sandwiches out there. 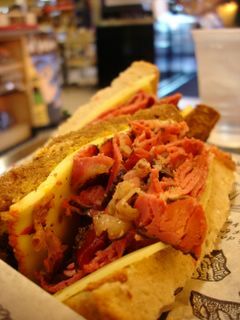 One of my goals is to get to Zingerman's before too long. It's great to see pictures of it ahead of time!! I'm originally from Ann Arbor and living in Irvine as well. Jerusalem Garden is a great place for falafels and Stucchi's for ice cream. Every time I go back home, there just aren't enough meals for all the food I want to eat. If you ever need any recommendations on food or things to do there, definitely let me know!